As a small business owner, you know how confusing it can be to get your hands on the working capital that you need. That’s particularly true if you’re just getting your business off the ground or operate a business in an industry that traditional lenders won’t work with under most circumstances. If you need a fairly modest loan and can repay it within a reasonably short period of time, CAN Capital may be able to help. This finance company has been in business since 1998, and they are known for assisting small- and medium-sized businesses with their short-term loan needs. In particular, they specialize in assisting businesses that tend to be turned down by more traditional lenders. So, is getting a loan from CAN Capital right for your small business? Find out in this review. When looking for short-term small business loans, it pays to learn about the background of any lender that you consider. One very reassuring thing about CAN Capital is that it has been in business since 1998. With nearly two decades in business, it’s pretty obvious that this finance company does a reasonably good job of keeping clients happy. Based in New York City, New York, CAN Capital has provided nearly 140,000 small business fundings through the years. The company also reports that around 70 percent of its clients come back to do more business with them, which is a very impressive rate of repeat business. Which Businesses Take Loans from CAN Capital? CAN Capital gears its short-term loans toward small- and medium-sized businesses. Most of the companies that apply for loans with this finance company are fairly new. Traditional lenders typically require companies to have been in business for at least a year or two, but CAN Capital only requires businesses to have been in business for a minimum of four months. That alone makes this finance company a standout. Businesses with bad credit also favor the lender, as it has very flexible requirements in terms of credit scores and the like. Companies that don’t need large loans tend to do business with CAN Capital as well, as the maximum loan that they provide is around $150,000. Finally, the company is willing to work with industries that many lenders won’t touch, so that attracts many small business too. The vast majority of the business that CAN Capital does revolves around providing small, short-term loans to small- and medium-sized businesses. They also provide merchant cash advances, which makes them stand out a little. These advances are ideal for businesses that don’t have a lot of cash to repay loans, as the repayments are taken from their daily credit card and debit card revenues. Basically, a percentage of each day’s sales are automatically sent to CAN Capital to repay these advances. As for the short-term loans, they vary only in their size, repayment period, effective annual percentage rate and a few other variables. 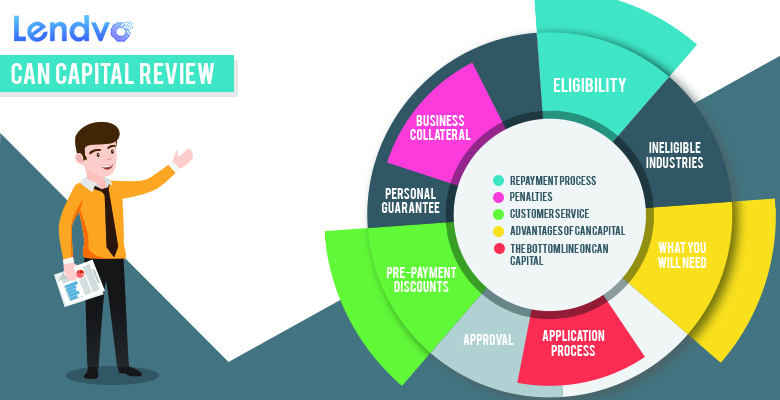 Qualifying for a short-term business loan from CAN Capital is fairly straightforward. At the absolute minimum, your company must have been in business for at least four months. It must have monthly average gross revenues of at least $4,500. You must also have a credit score of 550 or higher, which is very low when compared to traditional lenders. Additionally, you or your business can’t have filed for bankruptcy within the last 18 months, and there can’t be any excessive tax liens. Of course, even if you meet these initial requirements, there is no guarantee that your business will be approved. If your company belongs to certain industries, CAN Capital will not even consider providing a loan. Fortunately, the list of ineligible industries is fairly short. It includes: gambling, travel agencies, bail bondsmen, adult-related businesses, consignment companies, flea markets, illegal federal drugs, non-profits, employment agencies, insurance companies, direct marketing companies, car sales, auction houses, legal services, religious institutions, accountants, finance companies, real estate, collection agencies or consultants. Don’t rule out your company right off the bat based on this list, however, as it may change. It may still be worth it to apply and see. Another option is to call CAN Capital and see what they say. If you need working capital quickly, CAN Capital may be the answer. Before applying for a loan with them, however, educate yourself about what to expect. The company performs a hard pull on your credit reports, and this can negatively impact your credit. Therefore, you shouldn’t apply without having a fairly strong understanding of the details or of your chances for being approved. When stacked up against many other lenders, CAN Capital has fairly flexible requirements. However, there are drawbacks involved in taking out loans with this company as well. Some small businesses get exactly what they need from small business loans through CAN Capital while others fare better by turning to other lenders. Which States Do They Do Business In? – Some lending companies and banks only offer loans to businesses that are located in certain states. Conveniently, CAN Capital provides loans to businesses in all 50 states, so regardless of your where your company is located, you should be able to apply for a loan. Please note, however, that CAN Capital does not provide loans to companies that are located in the U.S. Virgin Islands or Puerto Rico. Loan Amount – CAN Capital provides short-term small business loans that typically range from $2,500 to $150,000. Therefore, they are not suitable for small businesses that are looking for very large loans. Most companies that obtain loans through CAN Capital have specific expenses to pay, which is why they only need a small amount. Although the amount of the loan that’s provided varies, CAN Capital typically provides small businesses with loans that are equal to around 8 to 10 percent of their annual gross revenues. Therefore, if your annual gross revenues total around $250,000, you may qualify for a loan of up to $25,000. Again, however, this is just a ballpark estimate. The actual amount that you are approved for may vary significantly depending on various factors. Loan Length – As far as the total time period of length of the loans that they provide, CAN Capital offers loans that can be repaid in four months to two years. Not surprisingly, the longer the loan period is, the more you will pay to borrow the money. Therefore, it’s advantageous to select the briefest repayment period that you can handle. Luckily, CAN Capital doesn’t charge an early repayment penalty. In fact, they give you a discount for repaying the loan early. Therefore, many businesses select a loan length that gives them a little “wiggle room” with the intention of repaying it early to receive the special discount. APR and Fees – One of the most confusing things about taking out a small business loan with CAN Capital is the fact that the company doesn’t publish APRs, or annual percentage rates, for the loans that it provides. An annual percentage rate reflects the total amount that you can expect to pay in interest and fees over the course of a year. This information is not provided for any of the loans that CAN Capital offers, which makes it tricky to compare and contrast their offerings with other lenders’. Based on the amount that must be paid back for loans of various sizes, however, it appears that the typical APR for a short-term small business loan from this company ranges from around 62 to 85 percent. This is significantly higher than APRs that are charged by banks and other traditional lenders and quite a lot higher than APRs that are charged by other alternative lenders. When applying for a small business loan from CAN Capital, you must provide a variety of information. Make sure that you have everything in order before applying online or over the phone for the smoothest sailing. CAN Capital requires companies that apply for loans to provide their business tax ID. The business owner must also provide their social security number and driver’s license number. You can expect to be asked to hand over the previous three months of bank statements for your business as well as any credit card processing statements that you have, if applicable. Additionally, you must provide the first page of the previous year’s business tax return. You must also agree to a credit check. CAN Capital does a “hard pull” of businesses’ credit, which means that their inquiry may affect your credit. Applying for short-term small business loans from CAN Capital is straightforward and easy. Most businesses apply for loans through this provider online, which makes the process easier still. If you are not comfortable with submitting an online application, you can also call and speak to a representative. They will process your application over the phone. Like applying for any loan, you are required to provide a lot of information about your business and, of course, you must provide the information that is highlighted in the previous section. If you are unwilling to provide personal collateral for your small business loan–which is completely understandable–you will be glad to know that CAN Capital doesn’t require it. However, the lending company does require business collateral for all small business loans that it processes. Most companies provide collateral in the form of business equipment. If you own real estate that is used for the daily operation of your business, it may fulfill this requirement as well. Before applying with CAN Capital, contact them to make sure that you will have the collateral that they need. Keep in mind too that whatever you put up as collateral may be seized by CAN Capital in the event that you don’t successfully fulfill the terms of your loan. Although you are not required to provide personal collateral when applying for a short-term business loan from CAN Capital, a personal guarantee is required. What this means is that CAN Capital will have the right to come after your personal assets if you fail to fulfill the terms of the loan. Whoever is accountable for repaying the loan–typically the business owner–stands to lose personal assets like their house or car if they fail to repay the loan as required. Even if your company goes out of business, CAN Capital may go after your personal assets to satisfy the unpaid debt. As a result, it is feasible for your personal credit score to be negatively impacted by taking out a loan with this company. One thing that makes CAN Capital stand out from other lenders in this space is the fact that they provide pre-payment discounts to small businesses that repay their loans ahead of time. Traditional lenders often charge penalties for repaying loans early, so this is a nice perk. As long as you have been paying on your loan for at least 90 days, you can pay off the remaining balance in one lump sum for a 6-percent discount. In other words, you can pay the full amount that is due minus six percent if you repay the loan ahead of time. This is a great way to make the loan a bit more affordable. Because CAN Capital doesn’t publish APRs for the loans that it provides, comparing its offerings to those of other lenders is tricky. However, it is possible to get a feel for how much the company charges in interest by considering how much you must repay for loans of various sizes. For example, if you take out a loan for $4,000 over a period of four months, you must repay CAN Capital $4,600. This equals an APR of around 85 percent. If you take out a $15,000 loan for a period of nine months, you must repay the company $19,725, which equals an APR of around 75 percent. Should you take out a 12-month, $25,000 short-term loan, you must repay $33,750, which equals an APR of around 62 percent. If you qualify for a loan through CAN Capital, you can expect to receive a decision very quickly. That is particularly true if you apply online. Oftentimes, small businesses are approved on the spot. Other times, they have to wait a few days to hear back. When notifying you of your approval, CAN Capital will also inform you of the total amount, terms and fees that go along with your loan. In most cases, the funds are deposited into businesses’ bank accounts within three business days. With such quick turnaround times, CAN Capital is a good option for small businesses that need quick access to working capital. To take out a loan with CAN Capital, you must agree to have your repayments automatically withdrawn from your business checking account. The finance company pulls repayments from business checking accounts on a weekly basis, and it is done through ACH transfers. In the event that your account lacks the necessary funds, you may be subject to overdraft fees from your banking institution. CAN Capital does not charge any fees of its own under such circumstances, which is a bit of a bright spot. If CAN Capital receives no activity from you for a period of 20 days, your account will be put into default. At this point, collection activities may begin. This is also when your collateral may really be on the line. Your personal guarantee also comes into play under these circumstances, which means that CAN Capital may elect to go after your personal assets to satisfy the debt that you owe to them. With all of these points in mind, it is crucial to repay your loan as required. Otherwise, you could lose personal assets and business collateral, and your personal credit may be negatively affected. CAN Capital is headquartered in New York City, so most of its customer service is provided by US-based representatives. Live support via telephone and live chat is available Monday through Friday from 8 a.m. until 8 p.m. and Saturday from 8 a.m. until 5 p.m. Email support is also available, and most customer reviews report that they receive replies from their inquiries fairly quickly. CAN Capital also offers an extensive FAQ on its website, and you can often find answers to questions that you have there. The only downside here is that some reviews note that representatives are occasionally confused and sometimes provide inaccurate information. Therefore, always read the fine print of the terms and conditions of your loan before proceeding. These advantages apply to certain types of small businesses, of course. To gain a fuller understanding of whether or not CAN Capital small business loans are right for your company, be sure to consider the drawbacks as well. In some cases, they may outweigh the advantages. Are Short-Term Loans from CAN Capital Right for Your Small Business? There are pros and cons to taking out short-term small business loans from any lender. The trick is doing your research and considering your reasons for needing a loan in the first place. With that information in mind, you can more easily determine whether or not CAN Capital is right for you. Because this company has been around for nearly two decades and has provided more than $4.8 billion in loans to more than 100,000 small businesses, its track record is impressive compared to that of many other alternative lenders’. If you are unable to secure a traditional loan from a bank or other lender and are willing to pay a little more to get the money that you need, however, taking out a loan with CAN Capital may be the right choice. For small businesses that are just getting started or that have credit issues, small business loans from CAN Capital can be lifesavers. However, companies that have decent credit and that have been around for a few years will generally find their loans to be a bit too pricey. Carefully weigh the pros and cons of taking out a short-term loan from this provider, and base your decision on your ability to repay it in a timely manner.